Growing up in Southern California, I have special memories of driving up the coast to Solvang to eat the most heavenly things I had ever tasted- Ebelskievers. They are slightly crunchy on the outside, chewy and warm on the inside- filled with delicious, oozey and sweet jam. HEAVEN!! 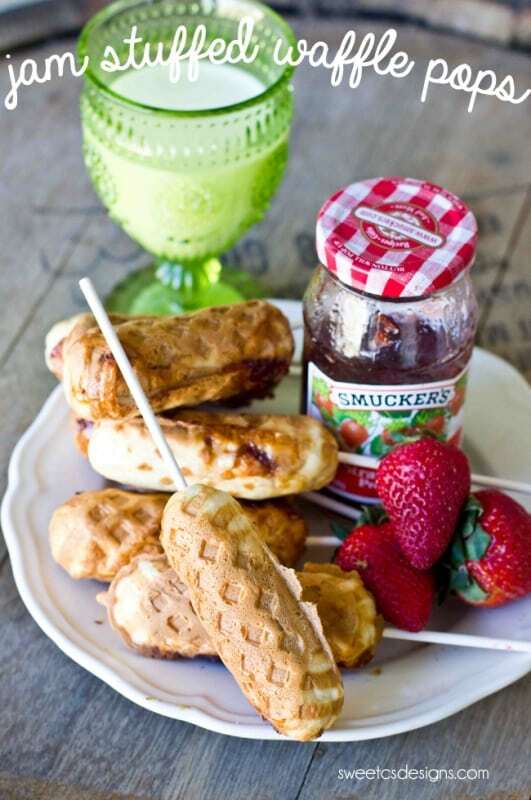 I have an ebelskiver pan and have made them a few times, but I was looking for a way to recreate the taste without as much work- and these Jam Filled Waffle Pops thankfully do not disappoint! I don’t know about you, but when having breakfast, I want something warm, delicious – and quick. 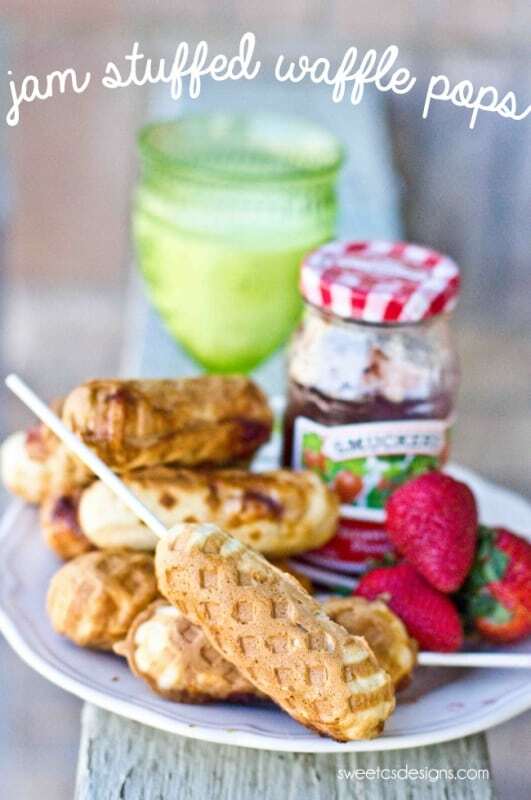 I am using a corndog machine to make these (which you can seem to find all over the daily deal sites- I grabbed mine from Zulily for less than $10) but you could also use a cakepop machine, or even just a waffle press and just slide in sticks to eat them with. It is really important to have quick hands when making this recipe. I found it to be absolutely easiest by using squeeze bottles for the waffle mixture and the jam. You’re going to squeeze 1/2 the filling you normally would into the corndog/cakepop/waffle machine, layer in some jam, and then fill the rest of the way. This can be done with spoons- but it is seriously SO easy when using squeeze bottles- and you can buy two squeeze bottles at just about every grocery store or big box store for under $2. These are especially delicious for parties and are perfect because you can walk around with them. We’ve been munching on them on busy weekdays- I make a big batch and then freeze leftovers, so I can just take them out of the freezer the night before to thaw, and pop in the oven or microwave on a busy morning to cook through. It’s not really messy for kids, and stays totally delicious! If you’d like a gluten free version, please feel free to use GF waffle mix in place of the standard waffle recipe I am using below. You can also use Krusteaz or another waffle mix if you aren’t gluten free and just want an easy way to make these. In a preheated cakepop or corndog machine, add just enough batter to cover the bottom 1/2 of the bottom cavities. Quickly add jam (it is easiest to put jam in a squeeze bottle and squeeze out onto batter), then add more waffle batter to fill the bottom holes. Add food-safe stick (I use wilton popsicle sticks) and eat warm. 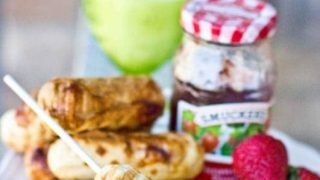 Oh, that looks so yummy, with my favorite Smucker’s strawberry jam too!